This Amazing NEW BOOK will give you PRACTICAL TOOLS for becoming a SPIRIT-LED Parent! As children grow and experience life, they face "giants" in many forms–the hurts, struggles, fears and temptations of the world that seduce countless young people away from their divine call to represent Jesus in both purity and power. 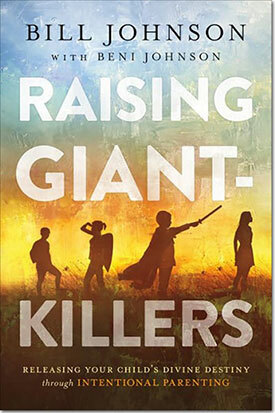 It is vital for parents to train children to defeat these giants–to become giant-killers. In these pages you will discover how to support their uniqueness, gifting and strengths as you help them think through the tough questions: Why am I here? What is God's Purpose for me? How do I fulfill it? You will also be encouraged to face and destroy your own giants, knowing that your example will become your children's inheritance. Let this book guide you to raise giant-killers–children empowered to make a difference, not only in their lives but in the world. Your Child's Destiny Starts Now! Bill Johnson is a fifth-generation pastor with a rich heritage in the Holy Spirit. Bill and his wife Beni, are the Senior Leaders of Bethel Church in Redding, California. Bill lives his life with the core values that God is good, nothing is impossible, the Blood of Jesus paid for everything, and we are significant. He travels extensively throughout the world encouraging Believers to bring the Kingdom of Heaven into their world and sphere of influence. Bill is also the author of a number of bestselling books including, When Heaven Invades Earth and Hosting the Presence.